Rail Story01535 680425work Museum - TransportRail Story brings together two museums in the station yard at Ingrow West. Discover the Carriage Works, home of the Vintage Carriages Trust. Here you will see a fantastic display of restored railway coaches, many of which have been used in famous film and TV productions. Including, of course, The Railway Children which was filmed on the neighbouring Keighley and Worth Valley Railway, climb aboard the coaches and imagine the cameras are rolling! At the Engine Shed take a look behind the scenes and see engines under repair and being maintained. Rail Story brings together two museums in the station yard at Ingrow West. Discover the Carriage Works, home of the Vintage Carriages Trust. Here you will see a fantastic display of restored railway coaches, many of which have been used in famous film and TV productions. Including, of course, The Railway Children which was filmed on the neighbouring Keighley and Worth Valley Railway, climb aboard the coaches and imagine the cameras are rolling! At the Engine Shed take a look behind the scenes and see engines under repair and being maintained. From the beautifully restored station at Ingrow West, you can hop on or off the Keighley and Worth Valley Railway, with a Day Rover ticket entry to the museums is free! 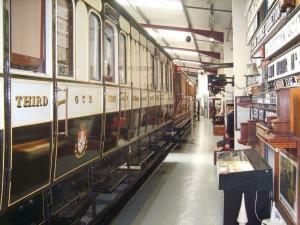 Admission gives entry to two museums: Carriage Works and Engine Shed. Entry for single museum is £2.50. Entry is FREE to KWVR Rover ticket holders. Concessionary, Child and Group prices available. Rail Story is located one mile south of Keighley on A629. The postcode BD21 5AX will not bring you to the exact location so please follow signs. Adjacent to Ingrow West Station on the Keighley and Worth Valley Railway.